More than two dozen subway riders were trapped in an elevator for more than an hour at the 181st Street station on the No. 1 line. 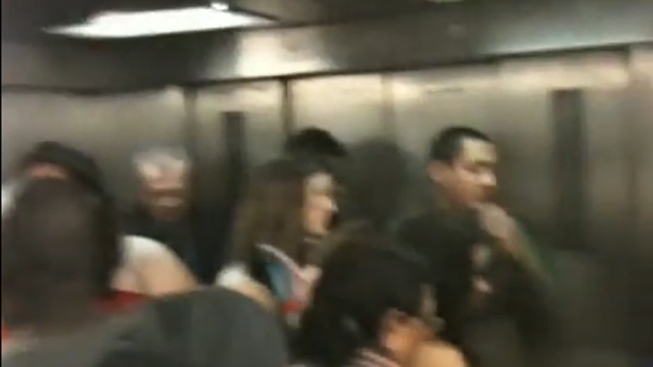 More than two dozen straphangers, including a young girl with asthma, were trapped in a stalled subway elevator in Washington Heights for an hour in an incident caught on video. Rescue workers eventually freed the 28 passengers who had been trapped in the 181st Street station elevator on the No. 1 line Friday night. The rescue was filmed by a tourist who was among the trapped people, which was first reported by NYC The Blog. In the video, passengers complained of rising temperatures and no air circulation. By the time a firefighter broke through the ceiling, a young girl with asthma was visibly frantic in the confined space. People around the girl attempted to cool her by fanning pieces of paper, and the responding firefighter offered words of comfort. "It's all right. It's okay. We're here," he said. "I'm not going anywhere. Everything's okay. I know it's hot." A ladder descended from the elevator hatch and the girl, who by then had to go to the bathroom, was among the first to leave. All passengers were transferred to an operating elevator and brought up to street level. FDNY confirmed that firefighters from Ladder 45 in Washington Heights responded to an emergency call about the elevator at approximately 8:37 p.m.
Two people were examined for medical issues, but refused further treatment, FDNY said. In a statement, the MTA said newly-installed hoist ropes were to blame. They were adjusted on Saturday and the elevator has since returned to service.